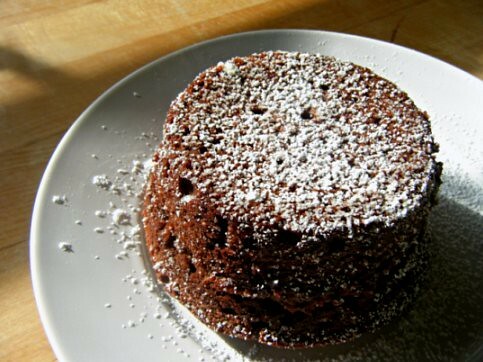 Many, many years ago, before I went to culinary school, I tried my first molten chocolate cake. I was perplexed as to how they were able to have a perfectly firm cake on the outside while having a molten chocolate core inside. I was sure it was done by placing some sort of frozen chocolate center into he cake before baking, or by injecting the cake with a hot center after it had come out of the oven. 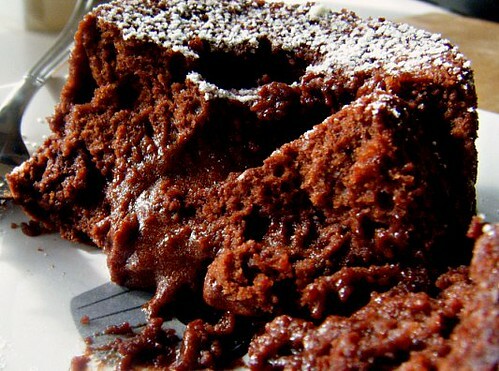 Molten chocolate cake is a little tricky because if you bake it for too long it is just a nice, very moist, chocolate cake. If you under-bake by even two minutes the cake will become a steamy hot puddle of chocolate sauce with a ring of cooked cake underneath (very tasty, but not very impressive looking). I know all this because when we made these cakes in my Advanced Pastry class we never got them quite right. So, I took the recipe home and tried it for myself. I baked the cake according to the recipe, tested, added five minute intervals to the baking time until I had a firm jacket of cake surrounding a soft melting interior. This recipe feeds four, but could easily feed eight adults if they are willing to pair up and share a cake. I suppose you could make the cake in eight smaller ramekins, but as I have not tried it I can not speak to the results you might have. The cakes are best eaten right from the oven, so if you are serving less than four people you can cut the recipe in half. Butter four 7 oz ramekins and set aside. Place the chopped chocolate into a bowl over a pan of simmering water. Stir until the chocolate is melted. Remove from the heat and stir in the butter and vnilla. Stir until all the butter is melted. Set aside. In the bowl of a stand mixer add the eggs and sugar. Whip until light in color. Stir in the chocolate mixture and blend until well combined, then add the flour and stir gently until all the flour is absorbed. 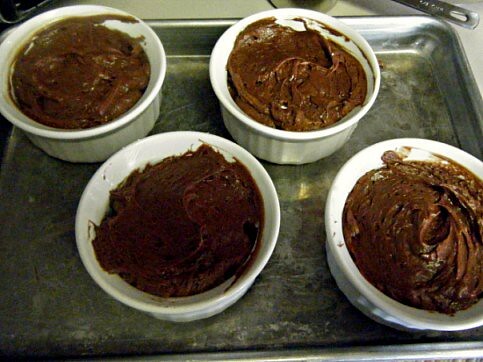 Spoon the mixture evenly between the four ramekins and place into the oven. Bake for 20 to 25 minutes, or until the edges of the cake are quite firm but the center is still soft when pressed. The top of the cake will just begin to release from the top of the ramekin. You can serve it in the ramekin at this point, or you can turn it out. If you plan to turn it out let the cake sit for one minute, then take a thin knife and gently slide it around the top of the cake to make sure the top edge of the cake is not sticking. Place your dessert plate on the top of the cake a carefully flip it over. 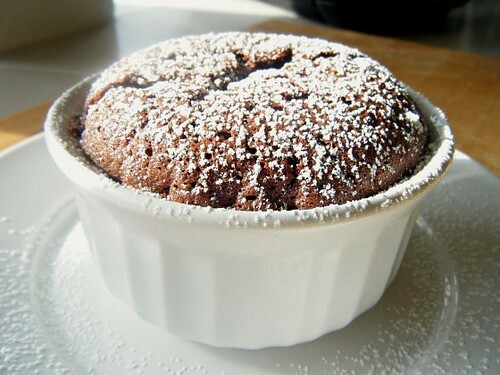 Lift the ramekin gently and the cake should slide out. Give it a small shake if it does not release.